Remember my Baby Boomers are Lazy blog? We explained how the banks were taking an $27.4 million / month of FREE money from Australian families. 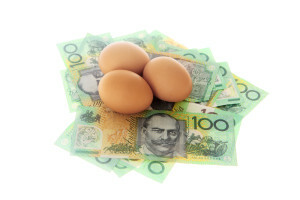 Reduce fortnightly payments by $69. That is a whole bunch of FREE money the banks won’t be getting from our happy TWC client. Now the client’s going to follow our recommendation and keep paying that extra $69 into the mortgage and save themselves a further $46,649. This equates to $134,649 or paying their mortgage off 6 years earlier! What would you do with the 6 years of mortgage payments if you didn’t have to pay it to your bank?? Don’t procrastinate, arrange to see one of The Wealth Centre Finance Brokers and reassess your mortgage ASAP to find out how much YOUR savings are. Email: nerissa@thewealthcentre.com.au today to arrange your appointment and find out how much you can save. Remember as a bonus at your initial meeting with one of our Finance Brokers you will receive your five 5 extra tickets into the Win $1 Million competition.